← Is US democracy being bought and sold? David Graeber has been much praised of late as a prophet of the Occupy Wall Street movement, and even if one doesn’t want to go that far, his book is remarkably timely. I received my review copy the day of the October 5th NYPD pepper-spray incident in Zuccotti Park. By the time I finished reading it, copycat occupations had sprung up in my adoptive home city (Montreal), my native city (Sacramento), and spots around the world. Graeber’s book shows that mass movements that result in debt cancellation—whether through revolution or amnesty—are inevitable, and suggests that we may be entering such a period now. We may also be entering a moment in which the philosophical and cosmic nature of debt finally becomes apparent. Debt’s striking synchronicity with OWS should not overshadow the fact that it’s also a formidable piece of anthropological scholarship. The book spans the concept’s evolution from the great Axial Age civilizations—adapting Karl Jaspers’s label to describe the period between 800 BCE and 600 CE in Greece, India, and China—into the age of global conquest, and finally though its bizarre mutations over the past forty years. 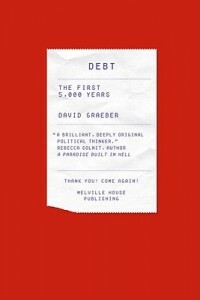 As Graeber shows, debt could not have taken the form that it did during the Axial Age without the appearance of currency, but it was also far from being only, or even principally, an economic matter. Debt was originally a moral and cosmological notion, about our debt to the gods (in India), to our parents (in China), or to the cosmos (in Greece, and sometimes in India). This entry was posted in ARTISTS/ACTIONS, AUSTERITY, CAPITAL, CAPITALISM, LOVE, OCCUPY STUDENT DEBT!, OCCUPY WALL STREET, OCCUPY!, Police and tagged "another world is possible", BANKS, CAPITAL, capitalism, corporate capitalism, debt, occupy wall street. Bookmark the permalink.